“It’s not luck. It’s something we think about,” insists Jim Graham, whose company, Graham Baba Architects, designed the Walrus and the Carpenter. Their imprint is on the blueprints of a growing number of local projects that house eat-and-drinkeries basking in the national limelight. Graham and his business partner Brett Baba have the magic to create magic. 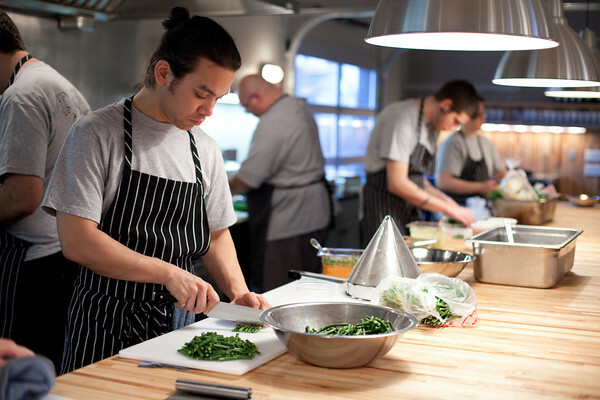 Their work defines the look of the new Seattle restaurant. 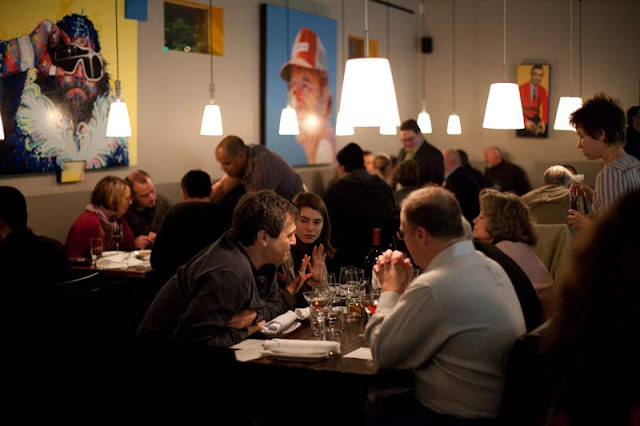 In addition to the Walrus and the Carpenter, they have designed (among others) the trio of Tom Douglas restaurants in the Terry Avenue Building at South Lake Union, Eltana and Skillet Diner on Capitol Hill and Revel/Quoin in Fremont. “It’s all about place-making. And we are basing all our decisions on how you get there,” says Graham. At the Walrus, those decisions extended to the height of the banquettes and bar stools, a glass wall looking onto Staple & Fancy next door, and the placement of a chandelier — which casts a sensual glow over the central oyster bar, and adds to the drama of lighting that reflects the Parisian mood chef Renee Erickson was after. Bringing creativity to a space regardless of the budget is key to the architectural team’s continued success, says Baba. “If the budget can’t support a lot of design or decoration in the public spaces, you have to pare it down and let the building be the expression of the space.” The firm has proved that amply in projects like the Melrose Market and the Kolstrand Building. Revel is another example. Seif Chirchi and Rachel Yang’s Korean-styled comfort food takes center stage at Revel’s broad, butcher-block table. It runs the length of the room, parallel to banquettes, above which hang ’60s-era light fixtures. Those were rewired and repurposed by Graham himself in the workshop where he’s also created the cast-iron-skillet art installation on display at Skillet Diner. “Restaurateurs come in with ideas, and all of them cost money,” says Graham, the chief architect on their restaurant jobs. “If you can distill your idea to one or two big moves,” you get the biggest bang for your buck. Graham and Baba, longtime friends and professional colleagues, teamed up in 2006. 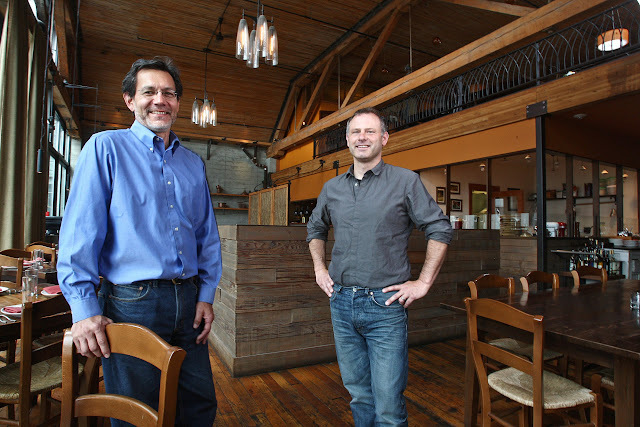 They opened for business in the Piston & Ring Building at 12th and Pike, which also houses La Spiga, their first restaurant project. Taking a daylight tour of that visually exciting venue, I better understood the lengths these architects and their team of five can go to interpret an owner’s vision. Intimate spaces transform a vast space into many “rooms” (booths, a bar, a loft that doubles as private dining). Visual design cues throughout, like the sheaves of wheat embedded in metalwork, reference the fresh pasta and piadina made on premise. Jim Graham, left, with Graham Baba designer Francesco Borghesi, in their office on Capitol Hill. When work is over, they don’t have to go far to find conviviality: the bustling bar at La Spiga, owned by Borghesi’s brother and sister-in-law, is right upstairs. The restaurant experience gathers all sorts of sensual response, Graham says, among them a forced intimacy. “The environment says it’s OK to sit or stand close — whether you know the person or not.” For Graham Baba, conviviality is a key element that turns a space into a place. 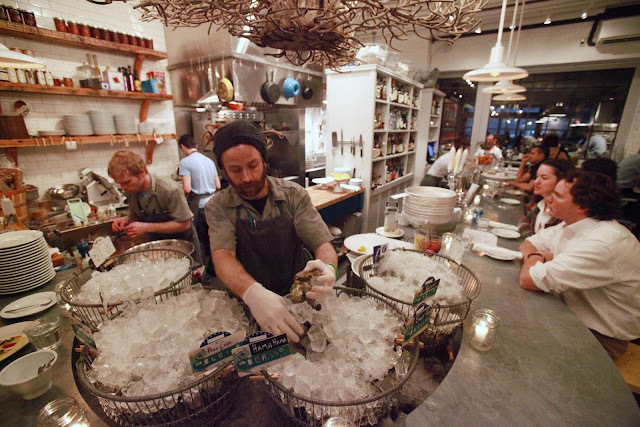 At Revel, cooks share their workspace with customers, who sit on high stools facing the kitchen. Think about it, Graham told me: When you’re at a party, where does everyone like to be? Yep: in the kitchen.